A lively and timely introduction to the roots of self-understanding–who we are and how we should act–in the cultures of ancient Greece, the Roman Empire, and Middle Ages and the Renaissance «Know thyself»–this fundamental imperative appeared for the first time in ancient Greece, specifically in Delphi, the temple of the god Apollo, who represented the enlightened power of reason. For the Greeks, self-knowledge and identity were the basics of their civilization and their sources were to be found in where one was born and into which social group. These determined who you were and what your duties were. 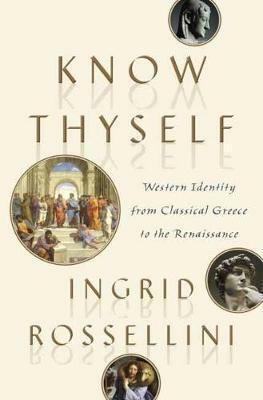 In this book the independent scholar Ingrid Rossellini surveys the major ideas that, from Greek and Roman antiquity through the Christian medieval era up to the dawn of modernity in the Renaissance, have guided the Western project of self-knowledge. Addressing the curious lay reader with an interdisciplinary approach that includes numerous references to the visual arts, Know Thyself will reintroduce readers to the most profound and enduring ways our civilization has framed the issues of self and society, in the process helping us rediscover the very building blocks of our personality.